We prefer dual chamber pacing for all valid indications but AAIR pacing remains a not so infrequently used option in our setup. RV pacing provides life sustaining rhythm support and is the most critical lead of a pacing system. However more and more patients are getting paced for non-life threatening yet highly symptomatic sinus node dysfunction. Therefore functional pacing and maintenance of physiologic cardiac activation is a prime concern when pacing for sinus dysfunction. To enable such, atrial pacing has evolved to be an integral component of pacing for sinus node dysfunction. As long-term RV pacing has been proven to be deleterious, it became unwise to pace the RV when the problem is in the sinus node. Therefore initial attempts to avoid RV pacing was to pace only the atrium provided the AV nodal function was acceptable. This was the AAI mode. [ Atrial demand pacing]. Subsequent development of advanced sensor technology enabled physiologic rate adaptation mimicking natural sinus node activity and AAI became AAIR [ Rate adaptive Atrial Demand Pacing]. Atrial only pacing was possible only if the AV node was normal – otherwise had to pace the ventricle. On the west side of the Atlantic, the skepticism for atrial only pacing was high and this accelerated the development of dual chamber pacing systems which would pace both chambers based on the underlying pathology and rhythm. 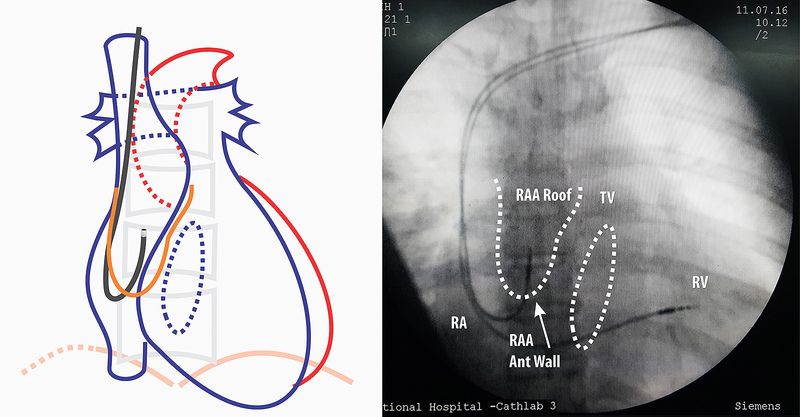 With regard to the site of pacing, right atrial appendage (RAA) is the location of choice – mainly because its an easily accessible and stable place. We avoid the lateral atrial wall because of phrenic nerve capture and the inter-atrial septum is only very rarely used for pacing because almost always, a good site in the RAA can be found. Kenneth A. Ellenbogen – Clinical Cardiac Pacing, Defibrillation, and Resynchronization Therapy 4e. Exchange stylet to a straight one and anchor the lead at the pocket after removing the sheath. Firstly, the lead has to be parked in the RA. If the system is going to be only AAIR then, the existing sheath can be used to insert the lead as described here for ventricular pacing. If it is a dual chamber system, an additional sheath has be in place as described here via an additional guide-wire as described here. 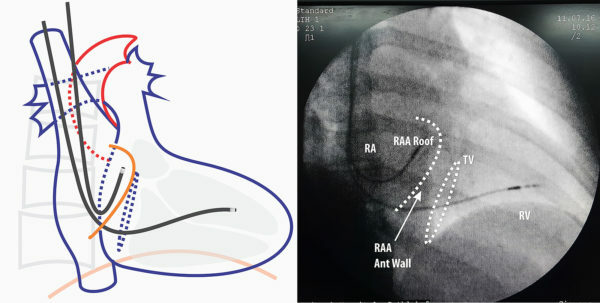 Figure : Lead Guided to right atrial appendage RAO view – If one is not sure about the position, RAO will confirm the anterior nature of the lead tip if it is correctly in the appendage. Video : Insertion of atrial lead through second sheath. The lead should be inserted along with same precautions for the RV lead. Once in RA, the straight stylet is exchanged for a J- Shaped stylet. 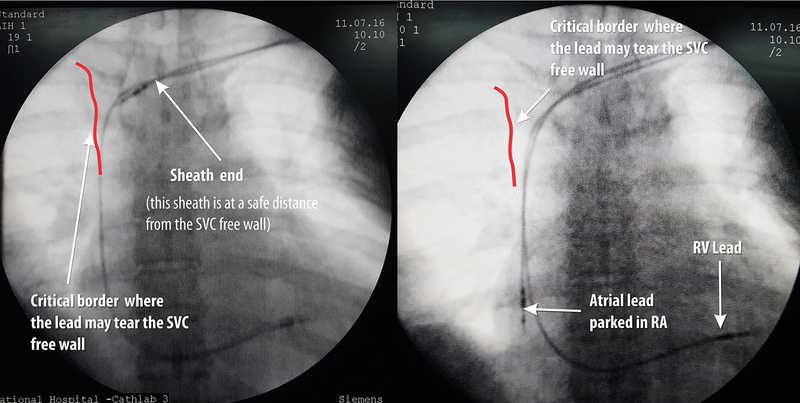 This stylet should be inserted carefully – because the leading edge of styles causes the lead to flex significantly and this can impinge on SVC/ Right atrial wall. Once the position is obtained, lead parameters are obtained.  Each lead is accompanied by a one or two pre-formed J shaped stylets – these vary in size and stiffness. Therefore if a lead refuses to move into the appendage, a stylet with a smaller curve can be tried. 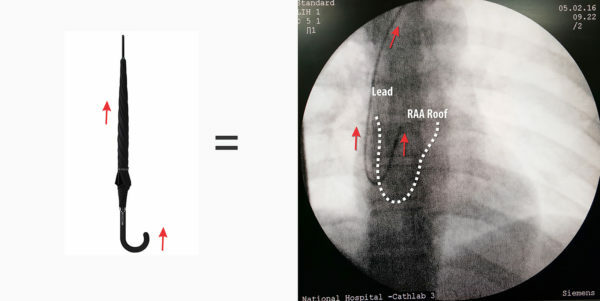 If one appreciates the shape of the lead which is given by the stylet) it can be easily figured out why it is dangerous to pull the stylet fast : It can lead to a lead out-migration through the appendage roof. If pulled fast, the J stylet tip provides force at the lead tip forcing it cranially against the appendage roof. Since the screw is already deployed, it gets further wedged in the muscle wall and if the site of anchoring has a thin wall, the deployed screw length is sufficient to reach out of the myocardium into the pericardium. The potential serious complication is bleeding to the pericardial space – but the usual symptom is central pricking sharp chest pain. Author has seen three such cases where symptoms rapidly resolved after re-positioning the atrial lead. 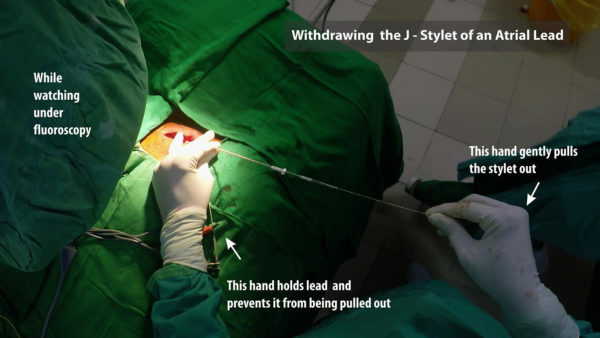 Figure : Technique for withdrawing the J-Stylet from an atrial lead. One hand is used to hold the lead tightly in place and the other hand to pull out the stylet. Initial withdrawal has to be very slow. It should be done under fluroscopy because witnessing the wriggling movement of the lead while stylet comes out confirms good fixation of the lead. If the pacing is for pure sinus node dysfunction, AAIR pacing can be considered (although dual chamber pacing is preferred). To pace in AAIR, one has to be absolutely sure that there is no current AV nodal disease. We assess this in two ways – Non invasively with Holter and Exercise testing and invasively during implantation of device. If holter and exercise ECG shows only evidence of sinus node dysfunction, we plan for an AAIR system and do intra-operative reconfirmation of AV nodal function. The intra-operative method is described below. AV nodal conduction is highly dependent on autonomic function. Increased vagal tone decreases conduction velocity and sympathetic stimulation increases conduction velocity. Although Wenchbach phenomenon occurs at fast heart rates, the phenomenon is often seen in healthy young physically fit adults during sleep as their vagal tone is high during sleep. AV nodal conduction is also influenced by drugs such as some calcium channel blockers, digoxin, beta blockers etc. In purely sick sinus disease, the AV nodal conduction is assumed to be normal. For pre-operative planning, we mainly do a holter and if the holter does not show evidence of AV nodal disease (baseline PR prolongation, Non conducted Ps in awake state) we consider AAI pacing. The issue with exercise testing is that due to sinus node disease, most patients are unable to mount a good sinus response to exercise – hence are unable to do an exercise ECG – but rarely a patient may have good chronotropic competence and if physically capable, doing an exercise ECG may provide useful information. Practical Tip : At high rates ( e.g. > 130) if the ECG is noisy or if the lead stability is precarious and you are seeing missed Ps haphazardly, its best to switch to AOO mode. To further add clarity, watch the pulse oximeter trace and the rate of the trace to corroborate with your ECG findings. If the Wenckebach Point is less than 120 bpm at baseline or fails to improve after atropine, we assume that the AV node has intrinsic conduction difficulties and switch to either DDD or VVI on availability of devices.